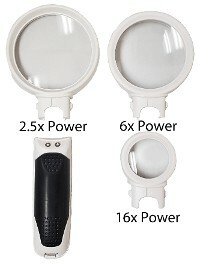 2 LED magnifier with three interchangeable lens. By simply pushing two buttons you can change the lens on this multipurpose magnifier. Switch between 2.75” (2.5x power), 2.50” (6x power) and 1.375” (16x power). The handle has two bright long lasting LED bulbs. Handle measures 4” long. Uses 3 “AAA” batteries (not included). Master Pack Carton: 18" X 13" X 10"
Gift Box Carton: 6" X 8" X 1.5"
Easy to position magnifier with powerful incandescent light bulb up to 60 watts, (not included) in floating reflector head which can be placed exactly where desired at the touch of a finger. Spring counter balance arm holds it where placed. Magnifier is four inches in diameter. Base clamps to edge of table. 110 volts. Switch for light. UL approval. Black color. Brighest lighting from ring of 10 LED lights circling the ground and polished glass. 2 3/4'' inch lens provides best viewing and magnification for any reading or hard to see task. Rugged case and easy to operate switch. Light powered by two ''AA'' penlight batteries (not included). 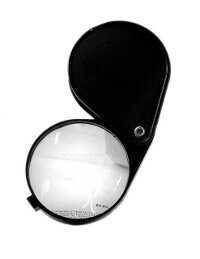 3 1/4'' ground and polished glass lens magnifier with 3x magnification. 12 super bright LED lights circle the lens to provide the necessary illumination for reading or examination. Light can be as important as magnification. Black color. Uses 2 ''AA'' batteries (not included). 4 1/4'' diameter head, 9 1/4'' long, 7/8'' thick. 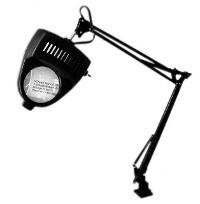 Two high-power, long-lasting, low power consumption LED lights makes this magnifier very useful in reading and looking at small items. Bifocal 5 power inset lens for the examining of smaller items. Stylish rimless lightweight construction. Large lens is 3 1/2'' in diameter and is 2.5 power. Handle is 5'' long. Battery door has hinge so you will never lose the door. Rubber on/off button. Uses 2 ''AAA'' batteries (not included). Glass lens or acrylic bifocal lens. 3'' diameter wide field magnifier combined with a powerful light. Operated from 2 ''AA'' penlight batteries in handle (not included). Sliding ''on-off'' switch. Black plastic case. Glass lens or acrylic bifocal lens. 3'' diameter wide field magnifier combined with a powerful light. Operated from 2 ''AA'' penlight batteries in handle (not included). Sliding ''on/off" switch. Black plastic case. Glass lens for optical quality. The extra large size gives an ideal field of view for reading. Shaped handle for holding comfortably. The enlargement magnification relieves eye strain and helps with visual tasks. Black color frame. Folds up so you can carry in pocket or purse and enjoy the utility of a big, almost 2 1/2'' inch lens (60mm diameter), made of ground and polished optical glass. Black plastic case protects lens and swings open to make a convenient handle. Big 3'' high quality ground and polished glass lens magnifier in traditional styling Chrome lens ring with ebony black handle. Big 3'' high quality bifocal lens magnifier in traditional styling Chrome lens ring with ebony black handle. 4 Power inset bifocal lens. 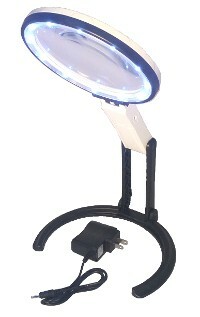 12 super bright LED stand magnifier with 5'' acrylic lens with a bifocal inset lens. Over 10 inches of space to work under the lens. Ratchet construction hinges to provide a sturdy balanced viewing area. Power provided by 2 ''AA'' batteries (not included) or AC adapter (included). Folds up for storing. Big 3 1/4'' diameter ground and polished glass lens, with skirted construction. Uses 2 regular ''C'' flashlight batteries for bright illumination. White color.